The mesmerising staircase at Nishi Building. Photo: Rachel Moore. 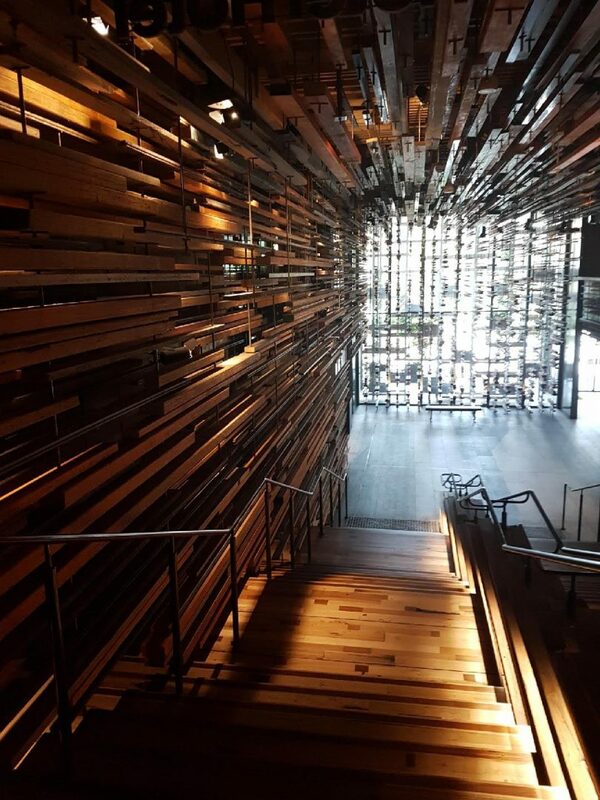 People have been trying to take me to Monster @ Hotel Hotel in the New Acton Precinct located in the award-winning Nishi Building for quite some time now. I always find myself returning to comfortable Canberra favorites that I have frequented for years. But after a delicious coffee and snack experience at the Cupping Room recently, I have made myself a promise that I will branch out and try some of these delightful jazzy new spaces Canberra has been delivering. 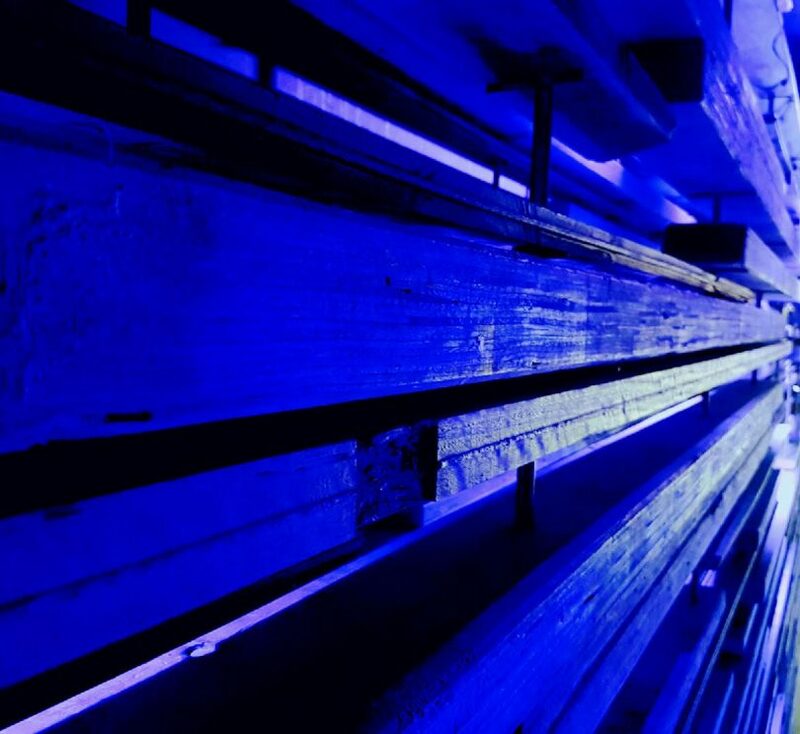 From the second you walk into the whole precinct – it is an experience. My mind instantly started wondering what kind of employment options were available in this space – cause I have so much spare time…. But those are the feels you get – “how can I find myself here more?” Every surface of the precinct holds beautiful art – curious vegetables and fruits grow around the gardens, and the space overflows with sprawling cafes, galleries, and bars, with a peaceful vibe throughout. The Nishi Building. Photo: Rachel Moore. The vibe in Monster was beautiful. I felt instantly relaxed. Even though it was a bright sunny day out, inside it was almost like there was a calm underbelly of sunshine with a splash of midnight darkness. The walls were adorned with unique and beautiful artwork, the furniture was a melody of comfort – timber, fluffy pillows, wicker, and steel. Monster is the kind of place where nothing matches – but has been clearly designed with such skill that it works beautifully. And it’s comfy. Regardless of where you might sit – it is comfortable. The staff were all lovely, calm, chilled, and well-presented and they seemed to not only like their jobs but remembered what customer service is all about. I gotta go off on a side note here to have a chat with the Canberra hospitality industry and ask you what is up!? There are some spaces and staff in Canberra where it feels like entering their café/restaurant/bar is an inconvenience to them. Their attitudes, body language, and interactions fall heavily into the ‘too cool for school’ category and there have been a few times that I have almost requested my money back due to poor attitudes and service. Just so you know – I go ok with the whole cooking thing and my husband is a far superior cook to me. If I leave my house to come and pay you to cook food or make me a drink – I feel like it should go without saying – be professional and polite. I am literally paying you. And you are being paid to be there. Enough said about this. Fortunately, at Monster, the service was ten outta ten. The staff were friendly, professional, and jovial – they could not have been more accommodating. When we arrived, I asked if they had any kind of lemon and ginger drink. Our lovely waiter asked exactly what I was after and when he returned with my Hubby’s cold-press coffee, I enjoyed a lovely soda water with fresh lime, mint, and ginger on the side. At this point, after skipping breakfast on a Sunday and already trudging around the Trash & Treasure Markets at Jamison looking for heirloom seeds for the veggie garden, I had my eye on the prize – a pork belly Bánh mì. Unfortunately – I also had my eye on my phone and Hubby accidentally ordered pork belly, fried egg, green mango and chilli Jam from their breakfast menu. 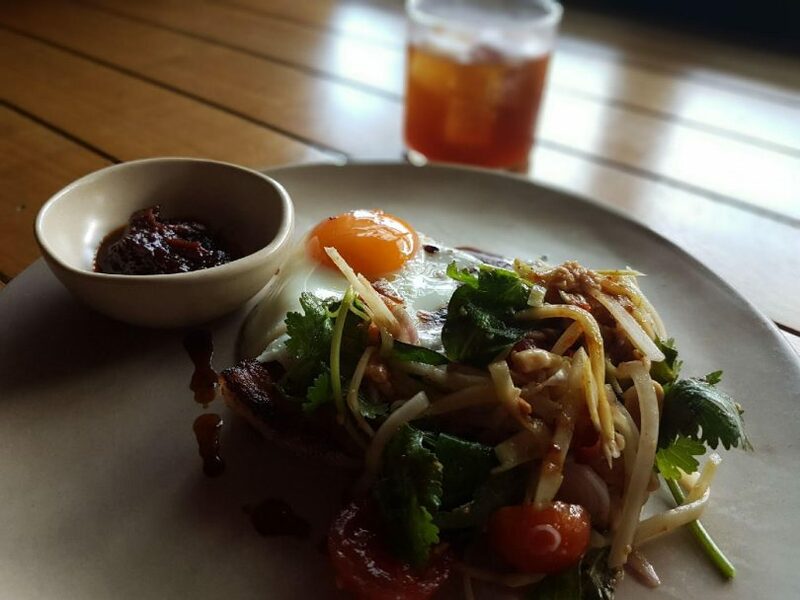 Monster Kitchen and Bar – Pork belly, fried egg, green mango and chilli jam. Photo: Rachel Moore. When it arrived, I wondered if the Hipsters had taken over yet another food classic and provided me with a deconstructed version of a Bánh mì? Nope – Hubby just mixed up a little, but I was so glad that he did! I really enjoyed every single mouthful of this dish. The flavours were perfectly balanced. The pork was cooked to perfection – moist, flavorsome and the fatty part of the belly melted as soon as it touched my tongue. The presentation was great and the sunny side egg was excellent. When we were paying the waiter he was sad to hear I had missed out on the Bánh mì. With wild joy in his eyes, he compared notes with my husband on the delicious roll as they have both been lucky enough to have enjoyed it. Monster – I will be back and so look forward to trying your Bánh mì! Share your experiences of the Monster Kitchen and Bar with us in the comments section below.